Shop Handbag Steals online at HandbagSteals.com which is a popular deal a day website focused on handbags, purses, and fashion accessories. Handbag Steals offers one amazing handbag deal a day starting at 8 a.m. central time for only 24 hours, at 60%-90% off or until it sells out. If you miss out on today's deal, sign up for Handbag Steals daily e-mail so you can be one of the first to see the deals before everyone else. Save on your next purchase from HandbagSteals.com with discounts, coupons, promotions and savings from 58coupons.com. Head on over to Handbag Steals and check out the Side Deals to save up to 90%. Click link to save. 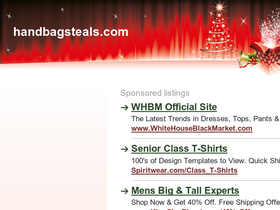 Hurry on over to HandbagSteals.com to save up to 905 on the deal of the day.